I know that I cannot check-in on facebook, for the building I have just entered is a secret place, protected by security cameras, sets of locked doors, and strictly enforced registration procedures for guests like me. After helping myself to coffee, I set up my laptop and wait for the women to arrive. I am determined to remember each of their names and remain focused on the task at hand during the entire class. They appear slowly, taking up different roles. Some immediately start to help set up the room, unfolding tables and unstacking chairs. Others fuss over a squeaky newborn, tucked into a mechanically swinging cradle. A few of the incoming women regard me with silent suspicion, a stance that is no doubt reasonably based on past personal experience. We are strangers. Compulsive overachieving is motivated by a drive for status in order to overcome psychological wounds. The overachiever desires more than is needed. 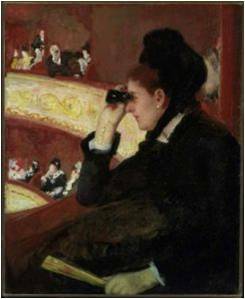 How are vision, gender, and class portrayed in this painting by Mary Cassatt, Woman in Black at the Opera, 1879? Talk amongst yourselves. I wonder if I have adopted something like this masculine position. I am always trying to help, to provide, regularly delivering food and other goods to friends and acquaintances. I even extend gifts to people I barely know. [Aside: My snap-top tupperware containers and storage tins are scattered throughout Edmonton. Who in the hell currently has the fancy Italian cake plate that I bought in Chicago for $100?] Some people resist this particular power dynamic more than others. MW thwarts me at every turn, seeing right through me even as he loves me. My LSP is the most recalcitrant, calling me out on this strategy while reaping its benefits. He is my equal, not my co-dependent. That is why I respect him. The other professor explains that while she is legally married, she rejects the value-laden construction of this institution, as well as its history of oppression. She admits to being “a pretty crappy wife.” I pipe up, saying that I am not married to my partner of 25 years for similar reasons, additionally loathing the consumer frenzy of weddings and refusing to own such socially-constructed symbols of—and replacements for—love as diamonds. “No governmental, religious, or social authority is going to tell me what my intimate relationships should or should not be,” I assert. I am struck by a thunderbolt of understanding. My ideals are informed by privilege, by my ability to say yes and no at the same time. Should I tell her that I was not always middle class, that I too have lived in fear, have seen women and children being beaten up? I open my mouth, but then stop. She doesn’t need another hero. Instead, I will try to act against type, and remember the valuable lesson that this insightful woman has taught me. This entry was posted in Uncategorized and tagged childhood, identity by feministfiguregirl. Bookmark the permalink.